Home / In the Media / Gulf News: Probe into Israeli building firm hailed. Gulf News: Probe into Israeli building firm hailed. Occupied Jerusalem: Israeli authorities have started an investigation into a construction company that filed bankruptcy after it failed to deliver sold houses in a colony built on Palestinian land, Israeli police said yesterday. “Police are investigating the owner of the company who left the country,” said a police statement, adding that it is planning to issue an arrest warrant against him with the help of the Interpol. 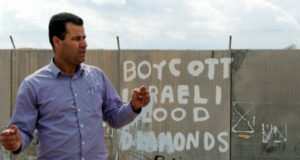 Abdullah Abu Rahmeh, Chairman of the Wall Opposition Committee in Bili’n village in the west of Ramallah considered the bankruptcy of the Israeli company Heftsiba a victory for Palestinians and their long struggle with the wall and colonies in their village. Abu Rahmeh told Gulf News that a year ago, the Israeli Supreme Court issued an order to cease construction work and not to connect apartments to the Israeli regional water and electricity networks until the petition submitted by the many people of Bili’n village was taken into consideration. 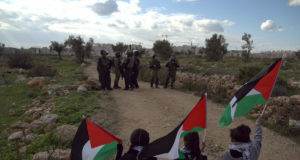 Human rights organisations, such as the Israeli organisation Batslim, confirmed that these lands are owned by Palestinians and not as claimed by Heftsiba Company. The company has built and sold thousands of residential units on land owned by villagers to religious Jews – despite these apartments not being part of the general plan of Metityahu settlement. As a result of this decision, the company, that was established in 1960 and specialised in building colonies next to Jerusalem, could not keep its promise to people who bought apartments in colonies like Modi’n, Ptir, Alit, Mitityahyu as well as Abu Ghneim mountain colony which is close to Bethlehem. It was supposed to deliver the premises earlier in August. The company was unable to complete work on those apartments, which led banks to demand their money from the company. Company debts reached more than $200 million [about Dh734.6m] in addition to $100 million [about Dh367.3m] as bank interest. The company rushed to court to file bankruptcy, in order to claim its money and to transfer the company’s properties to banks. Statistics reveal that the company built more than 4,000 apartments in Israel; as such, it is considered one of the largest construction companies and its shares of the Israeli construction market are estimated at 20 per cent. Abu Rahmeh confirmed, with a smile on his face, that this victory will not prevent them from continuing to demonstrate every Friday. It is well-known that Bili’n village is now considered a symbol for fighting the wall. 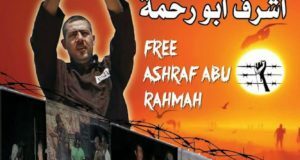 Abu Rahmeh also added that even foreign peace activists come from abroad just to protest in the village. Moreover, many Israeli peace activists participate in the weekly demonstrations and get shot at by Israeli bullets as happened last week when an Israeli peace activist was shot. his colleagues. The Heftsiba company case is considered a precedent in the history of the Israeli-Palestinian struggle. It has propelled Israeli officials to call for a governmental session in order to study the reason for the company’s downfall and how to prevent a setback in the Israeli colony policy. A number of experts warned that this will have a tremendous effect on the collapse of the construction sector, which has already suffered from a deep recession since the beginning of this year, General Deputy Manager of the Investment and Financial Market Company, Timer Port, told Gulf news. The stock market administration in Tel Aviv, stopped the circulation of Heftsiba’s stocks threatening that it will stop the circulation in all companies that deal with it if these companies do not publish a special report on its financial data before the middle of this month.